Today is Thanksgiving, and that means company. Company, of course, means food and cooking. Back when I reviewed Jonathan Bloom’s book American Wasteland, I mentioned his contention that large refrigerators lead to more waste. I agree that large refrigerators tend to be wasteful. Not only because you end up storing more than you need, and losing things in the back, but because you are cooling the refrigerator 365 days a year when you only use it to maximum capacity ten days a year. But what do you do when houseguests turn up or you are hosting a dinner party, and you wish your refrigerator would just stretch? Follow these tips and you may save yourself some money next time you need a new refrigerator. Throw out old food and use up the rest. If you are cooking up a storm for a crowd, you don’t want all those leftovers hanging around. Get rid of excess varieties of dressings, mustards, sauces and drinks. These are what tends to take up the extra space. Take foods out of the refrigerator when possible, like apples and oranges. Tomatoes, onions and potatoes should always be stored at room temperature. Transfer foods to smaller containers when possible. Ask the neighbor for some refrigerator space. Or perhaps you can borrow the refrigerator in your church, synagogue or community center. Always ask permission and label your food carefully. Avoid storing the cooked food for long stretches. For instance, when hosting for a weekend plan plan to cook one of the later meals in the slow cooker. Cooking one meal at a time, with careful planning, works better here than cooking three days’ worth of food in advance. Chill drinks a few hours before they will be needed. Be relentless about getting rid of leftovers, by offering them up at the next meal or to a hungry family member. If you have a small amount, put it in a small bowl or as one option in a divided serving platter. Containers of small amounts of leftovers will fill up the fridge quickly and are likely to get spoiled. Get one or more ice chests for storing food that won’t fit. They’re much cheaper than the cost and maintenance of a larger-capacity refrigerator, and they don’t take up room in your kitchen when you don’t need them. And they’ll come in handy for an electrical outage. If all else fails, rent a small refrigerator. You could also buy a used one and resell it at a similar price. Some people store an extra refrigerator and turn it on only a few times a year. That can work, if you don’t need that space for other things. Keep in mind that older models are notoriously inefficient. And if it’s in an out-of-the-way place you’ll want to check on it regularly to make sure it’s working properly. Have you ever run out of refrigerator space? Do I Need a Second Freezer? Is This Food Safe to Eat? When Hosting, How Much Is Too Much? Should Vegetarians Warn Dinner Hosts in Advance? That’s funny, “you only use it to maximum capacity ten days a year.” I don’t think that applies to the readers of this blog that I would know. :):) I guess you have a big readership! I find myself rearranging thing in the fridge every week to fit things in for Shabbos. We have an extra refrigerator that we turn on before the Chagim and Pesach or a simcha. Hi Debbie. It’s true I have a big refrigerator, but it’s rarely full. It depends a lot on your cooking style I guess. Excellent advice, Hannah. I myself never understood how much food was getting wasted in my house till I got rid of the second fridge. And about how condiments take up room – so true. Miriam, thank you. I don’t keep many condiments, but when I visit other homes or see pictures I realize that that’s what most people have in their fridge. Abbi – I agree with you. When I did online shopping in NY, I bought and spent much less. None of that wandering down the aisle and throwing in cans of olives and corn even though you have six of them already. Haven’t tried shopping online here in Israel yet, though. I also have a secret weapon, in the form of my husband. He has a magical ability to Make It Fit. So I leave the food out on the table after I finish cooking, and he finds a way to get it all in the fridge. Also a helpful skill when we’re stuffing our car before a vacation. I’ll contact you by email. 3. I buy storage containers that fit stack better inside the fridge. The ones that I have fit perfectly inside my fridge, so when I need teh space I take out food from cookware into the plastic containers. Obviously, no round or weird shapes allowed. not even squares, they waste too much space. Good ideas, Raquel, although the eggs in the US don’t keep as well outside the fridge. I especially like the one about containers. Shape and size of containers is so important! I’ve been planning to write about that for like forever. Milk can also go in the freezer, the key is to remember to defrost it in time. Abbi, great! Try and keep it universal please. About the eggs. That’s because the eggs we buy here, depending on where, can sometimes be just a day or two from the farm when we get them. But, the eggs in the states have sat around for very much longer before they get to the shelves. It’s a whole different ball game. Thanks for the explanation, Debbie. I also thought it had something to do with the way they are treated there. LOL cold weather helps a lot in the winter. Very interesting and useful post – thanks! Condiments: Since you believe in frugality, why throw out condiments if they are good? If you bought a different kind of mustard, pesto or tapenade to experiment with, do you really recommend discarding them? Large refrigerator: My refrigerator is always full because I believe in using a high percentage of vegetables and they take up a lot of space. Ideally I would shop every 2 days but that isn’t always practical. Also, if a vegetable that keeps like carrots is on sale, I tend to buy a larger amount, and then I don’t need to buy any the following week or two when they cost more. Apples and oranges – For a few days yes, I would take them out, but mine keep much longer in the refrigerator. Very interesting about the milk and eggs. But how do you know the eggs are still OK? Shopping – I’m looking forward to a discussion with Abbi about this. What about the cost of delivery when you shop online? Also, how do you have a sense of what’s in season, discover and learn about new items and new produce varieties, meet other shoppers and learn to cook from them? I could go on and on about the pleasure and value of shopping at the store. Faye, you’re right, I wouldn’t throw away the condiments (or drinks). And a professional cook like you probably uses a good variety on a regular basis. But most people don’t need them. Don’t throw them out–use them up or give them to a neighbor! Hannah, you’re probably right. I probably use more kinds of flavorings than most people. But for everyone I feel variety of produce is important both to keep meals interesting and because different fruits and vegetables have different nutrients, and they take lots of space. 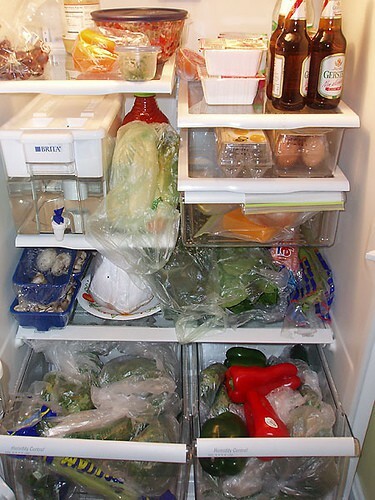 In a small refrigerator there is more of a tendency for the fruits and vegetables to crush each other. A point/counterpoint with Abbi sounds like fun but I don’t have time to promise anything formal. I’ll come by and join the conversation as I often do.